William Batchelder Bradbury (1816-1868) was an American composer of Gospel songs and hymns. He wrote the music for such familiar hymns as "He Leadeth Me," Holy Bible, Book Divine," "Jesus Loves Me," "Just As I Am," Saviour Like a Shepherd Lead Us," "Sweet Hour of Prayer," and "The Solid Rock." Buried in Bloomfield Cemetery, Bloomfield, New Jersey, USA. 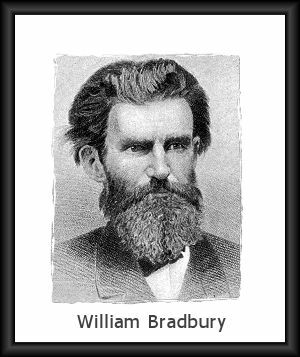 William B. Bradbury. Biographical sketch. William B. Bradbury: Composer of Hymns. Short biography. William B. Bradbury: Composer of Some Familiar Hymns.